A Victorian game. 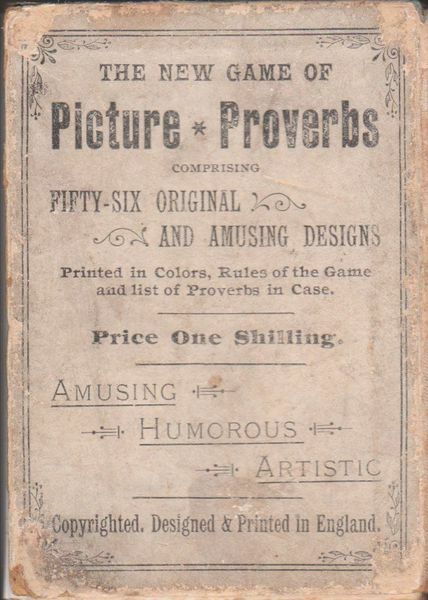 The sets in the game are made up of two cards, one with the first word of a proverb, the other completing the proverb. Players are given 24 counters, six of which are placed in the Pool. In your turn you may ask any one player for the other half of a Proverb. If you fail, you may then ask any other player for the same card but if this is also a failure, you add a counter to the Pool and your turn ends. When a completed Proverb is collected, you lay it in front of you and you receive one counter from the Pool. When all the Proverbs are collected, the player with the most claims all the counters left in the Pool. The player with the most counters, wins. When asking for a Proverb card, you should ask for it by naming the part you need. It is suggested that if children are playing, they can ask for a number (the card pairs all have a number on them). The game is for 5 or more players but there are special rules if under 5 are playing.